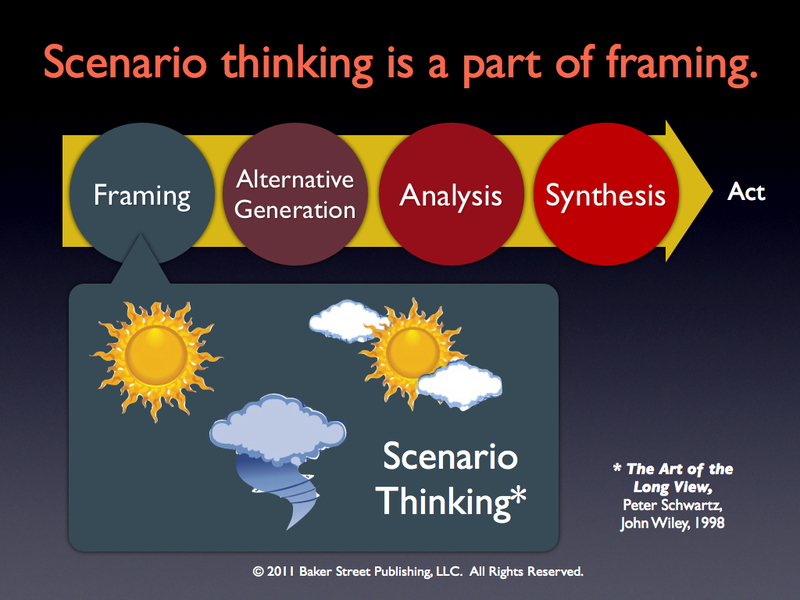 Scenarios are a very popular decision framing tool. Recently I did a LinkedIn poll. I asked people in several LinkedIn groups to vote for their favorite decision framing tool. The choices were issue raising, pros and cons, SWOT’s, scenarios, and project vision statements. Issue raising is the most popular with about half the votes. Scenarios are a close second. Why are scenarios so popular? According to Bain Consulting, scenario planning peaked in about 2005 but scenarios are still used by about 30 percent of organizations. McKinsey recently had a good article on the uses and abuses of scenarios. A more recent book on the mechanics of developing scenarios is Scenarios Planning in Organizations, by Thomas Chermack. We all use weather scenarios to guide decision making in our daily lives. For example, a weather scenario might be that tomorrow is going to be a beautiful sunny day. Another scenario might be heavy rain, thunder, and lightning. If you are planning a birthday party then these scenarios put a frame around what the possible outcomes might be. It gives us an idea of what sort of alternatives make sense. If the sun and rain are equally likely then having the party on the porch might be a good alternative. The back yard will be bad if it rains. Inside will be bad if it is sunny. The porch is a good hedging strategy. Back to the orginal question, ” Why are scenarios so popular for framing?” Framing is the first phase of strategic decision making. It is the part of the process where we think about who needs to be involved and scope. See Coach’s Guide to the Collaborative Design Process. See also Coach’s Guide to Framing. 1) Scenarios provide a way for a team to have good, open, articulate conversations about what the future might look like. One of the biggest framing traps is that we get too hung up on one view of the future. Or, we are too optimistic or too pessimistic and we let our biases limit our thinking. Scenario exercises are a way of introducing some balance. 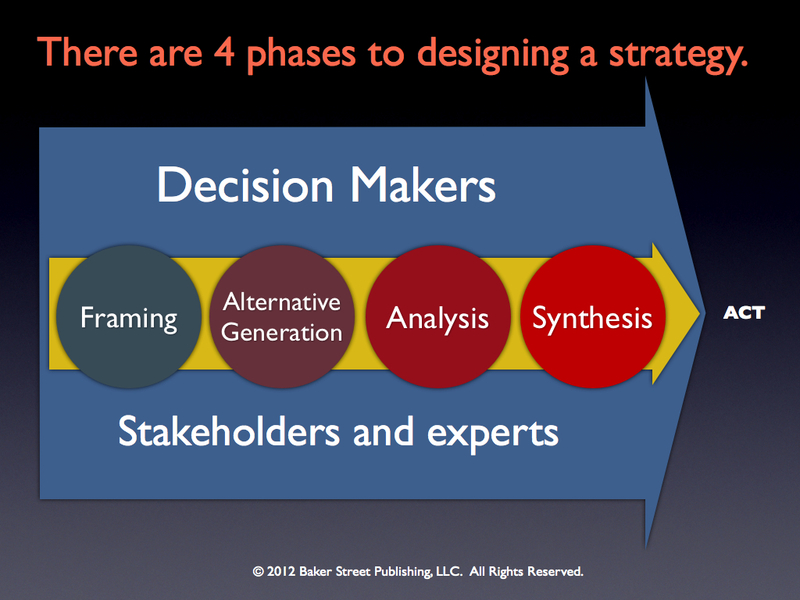 A handful of stakeholders often dominate the early phases of a strategy project. Scenarios are a way of getting all the stakeholders engaged in an open, thoughtful manner. Stakeholders can check their guns at the door and talk about the future without fear of a gunfight. 2) Scenarios are open ended. Framing is an expansive process. Scenarios provide a framework for talking about everything: business, politics, economics, technology. There are no organizational or disciplinary boundaries. All points of view are legitimate. 3) Scenarios suggest hedging strategies. Many strategic decisions we face are like the birthday party decision. Hedging strategies turn out to be the best way to proceed. Business is full of situations where it is best to have the party on the porch. I am beginning to understand why lawyers make more money than decision coaches. Lawyers are typically not as good as engineers at understanding design, systems, and the importance of collaboration. Lawyers are good at identifying bad scenarios and developing strategies to mitigate their consequences. They call it “risk management.” Most clients want to avoid “risk” more than they want to create value. My advice is to get a law degree if you want to do risk management. But that’s another blog. Decision coaches help manage uncertainty, which is more than “risk management.” People who can conjure up good scenarios and then figure out how to make them happen are called visionaries. Decision coaches can help both visionaries and lawyers accomplish their goals. Baker Street posts about twice month. If you would like to receive posts automatically by e-mail, just submit your address here.